The Brief for the project from Blacktown City Council was to design a new Café and Amenities Building in addition to a Community Garden Facility within the Blacktown Showground and Francis Park Redevelopment (by McGregor Coxall Landscape Architects). The Redevelopment, close to the Blacktown CBD, involves the creation of a new public recreation space providing Picnic, BBQ; Water play; Playground; Plaza; Community Garden Facilities. 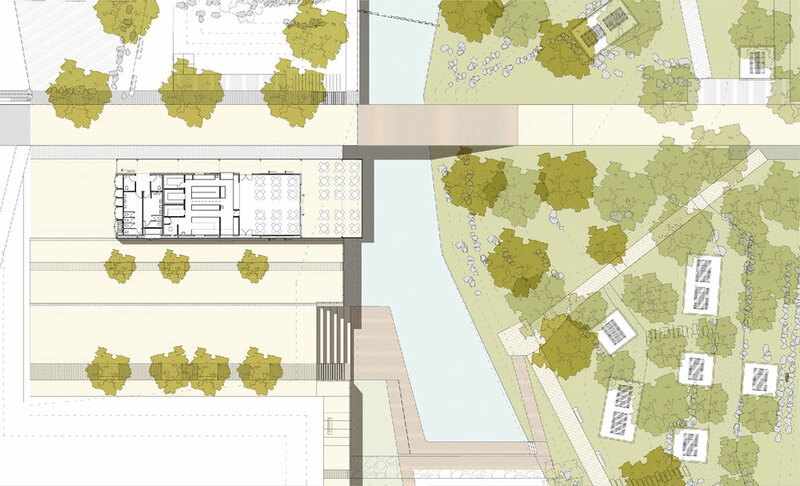 The site for the Café sits on the Central Plaza adjacent to a formal Promenade through the site and overhangs a revitalized natural water course and riparian corridor. The Community Garden Buildings sits further to the west on the Promenade addressing and servicing the Community Garden allotments. The Café building comprises a lightweight glazed box element housing the café seating which opens onto a generous outdoor covered dining area overhanging the water. This is juxtaposed with a more solid masonry element housing site services, kitchen and public amenities. The two elements are contained within a simple linear structure with an exposed portal frame. The masonry element is wrapped in a “green” screen consisting of powder coated aluminium angles and flats. This screen is taken around to the promenade elevation creating a ribbon of shading. The screen provides a cohesive urban image for the building as well as a protective and textured layer in an exposed environment.